Ancient Ephesus in Turkey is full of buildings erected mainly during the Roman era. A tour in Ephesus gives people the opportunity to have a view to the daily life of the ancient habitants of the city which had grown to one of the most important centres of the Roman and even the Byzantine Empires. The ancient buildings that have survived nowadays are described below. The Magnesia Gate had been built to the side of the road that connected Ephesus with Magnesia. It consisted of three openings two of which (the side ones) were used by pedestrians while the middle one was used for horses and chariots. The Girls’ Gymnasium has been named after the female statues that adorned it during ancestry. The Gymnasium of Ephesus was located near the Magnesia Gate, on Pin Mountain and it was built in the 2nd century AD, by (according to an inscription) Flavius Damianus and his wife Vedia Phaedrina. A big part of the vaulted segments of the Varius Baths of Ephesus are in a pretty good condition even nowadays. The baths were firstly built during the Hellenistic era and then enlarged during the Roman and the Byzantine Times. The Odeion of Ancient Ephesus was financed by a wealthy citizen named Vedius Antonius. It has a semi-circular shape, just like a small theatre. The Prytaneion was an administrative building consisted of a courtyard, on the front side and a large hall to the back. Hestia’s sacred flame had been placed in the middle of the yard, which was guarded by the priests of the goddess, known as Curettes, as the flame should never go out. The Market Basilica was a 160 m long arcade, to the north of the State Agora. Initially, it consisted of Ionic order columns, dividing the arcade into three naves. The State Agora was mainly used as a political centre were governmental discussions were carried out. A large number of graves, dating back to the 6th-7th centuries BC, a stone road and an archaic sarcophagus of terracotta were brought to light during excavations to the northeast of the Agora of Ephesus. This monument was a memorial to Memmius, son of Caius and grandson of the dictator Sulla. It was built in Ephesus during the 1st century AD by Augustus. Named after the Curetes (the priests who took care of the flame of the Prytaneion of Ephesus), also known as Embolos, it was one of the three main streets of Ephesus. Curetes street connected Gate of Hercules with the Library of Celsus. It was built in the 1st century (probably 97 AD) by a rich family of ancient Ephesus, that of Offilius Proculus, who wanted to pay honors to Sextillius. Erecting buildings devoted to the Romans was common for the Ephesians in order to be in good relations with the Roman Empire. Just like the Polio Fountain, the Domitian Temple had been dedicated to a Roman Emperor. Domitian was the first Emperor who allowed Ephesians erecting such monuments to the Romans and it was a great honor for the city of Ephesus. The Fountain of Trajan was built to the north side of Curetes Street, in the 2nd century AD and it was dedicated to the emperor Trajan. The pool of the fountain had been adorned with statues of Aphrodite, Dionysus, Satyr and the family of the Emperor. Named after a Christian woman who took over the restoration of the Baths in the fourth century AD, they were initially built in the 1st century. Scolastica Baths were located along Curetes street and they consisted of three levels however two of them have collapsed. It is one of the most well-preserved and beautiful buildings of ancient Ephesus and it is located along Curetes Street. It was constructed in the beginning of the 2nd century AD and reconstructed in the 4th century by Theodosius in honor to his father (General Theodosius). The Latrines were the public toilets of the Ephesus city and entrance fees were necessary to use them. Actually, they were a part of Scolastica Baths and they were situated next to the Temple of Hadrian. These houses were built on the slope of Korressos hill opposite the Temple of Hadrian in Ephesus. They were also known as the houses of the rich people of Ephesus and they consisted of two storeys of rooms surrounding yard. 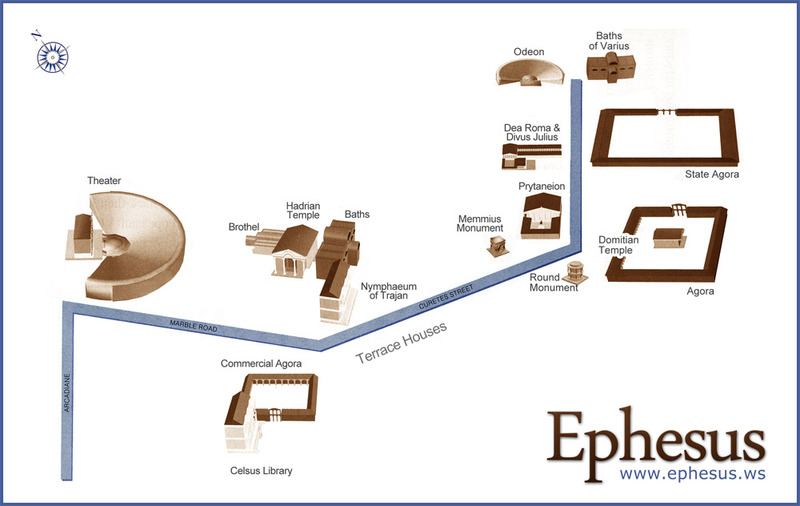 The Brothel of Ephesus was located at the crossing point of the Marble and Curetes streets. There were two entrances one from each street and the building consisted of two floors. The Library was built by Gaius Julius Aquila to honor his father Julius Celsus Polemaenus, General Governor of the roman province of Asia, in 135 AD, designed by the architect Vitruoya. It was one of the largest libraries of the ancient world and it could host more than 12,000 scrolls. It is a colossal Gate built by two slaves in order to pay honors to Augustus and his family because he had set them free. It was used as the south gate of the Commercial Agora. The Marble Street was the main street of the city, connecting the Magnesian Gate (south) with Korressos Gate (north). The south side of the street led to the Temple of Artemis. The Market Square, also known as the Agora or Commercial Market, was the commercial centre of the city. It was located along the right side of the Marble Street (directing from the Great Theatre to Celsus Library). The Great Theatre was built on the foot of Panayir mountain and its façade faced the Harbour street, in the first century AD and later on it was renovated by several Roman Emperors. It is considered to be the most imposing and the most impressive structure of Ephesus city.